Beautiful pillow & great price! I would recommend ! 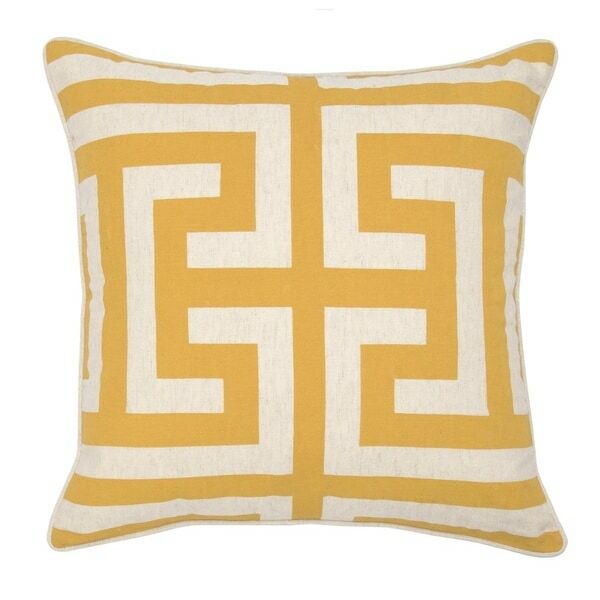 A modern take on the timeless Greek key motif, the Lana Pillow provides texture and dimension to any décor. The mesmerizing print adorns the soft and luxurious fabric, creating a chic and cozy pillow. Handcrafted to perfection, the pillow showcases artisanal skills and promises plush comfort for any home. Pillow Fluff Technique: Hold pillow at its edges. Push in pillow towards its center and pull out pillow toward its edges. Repeat the inward-outward movement until pillow feels plump at center." I was really impressed by the quality of the cotton /linen cover and the amount of fill in the pillow. Highly recommend. This review was written by a full-time Overstock employee. I received this product for free in exchange for my honest feedback. Well built pillow! I quite enjoy the quality of the fabric and the weight of the pillow with it being real down filled. Classy simple style. Thumbs up. Well made with quality fabric! They look great! Yes, I would recommend to anyone! Excellent quality and stunning colors!